Bed liners are one of the most important ways you can protect your truck against everyday wear and tear and damage from payloads. Along with tonneau covers, bed slides, bed lids, and spray in bed liners, these Houston truck accessories can provide added utility and improved protection against scratches and damage that can occur when hauling payloads or moving items in the bed of your pickup truck. Practical and versatile, these Houston truck bed liners, tonneau covers, and liners and other truck bed accessories are available in sizes to fit short bed, long bed, and standard pickup bed sizes for almost any make and model of vehicle. Traditional bed liners and bed mats can provide a rugged barrier between your payloads and your pickup’s paint and finish, allowing you to haul brush, metal parts, or fencing materials easily and without fear of damaging your truck bed. Constructed out of durable vinyl, plastic, or other composite materials, these truck accessories are usually designed to cover the bottom, sides, and tailgate of the pickup for maximum coverage and protection. Most bed liners are matte-black and textured to provide improved traction and increased coverage for minor scratches and scuffs that may occur during loading and unloading. Spray-in bed liners are ideal ways to enhance the outer appearance of your pickup while protecting your vehicle’s finish against scratches, dents, and mars that can lead to rusting and reduce its longevity. They are usually formulated from polymers that are designed to adhere to the bed and protect it against impacts and abrasive materials. Spray-in bed liners can increase the durability of your pickup and allow you to haul a wider variety of payloads with confidence. These innovative truck accessories allow you to organize and access your cargo more easily. A sliding tray is installed on your pickup truck bed and can be loaded with tools, farm produce, or any other items that require secure storage while en route to your destination and easy access upon your arrival. Bed slides can also eliminate the need to climb up and down to load the front end of the pickup bed; instead, you can simply load the slide completely and then reposition it into place with no climbing necessary. This can significantly speed up the loading and unloading processes to boost your productivity for work and home projects alike. Tonneau covers can protect your payload from the effects of wind, rain, and weather and can secure items against theft or loss. Matching tonneau covers and liners can significantly enhance both the usefulness and the appearance of your pickup and can offer secure storage when you need it. 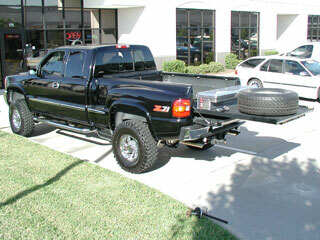 Tonneau covers are typically designed in a tri-fold configuration; other styles are available for some pickups and some bed lengths. We also sell a full line of tie downs, Houston lift kits, and other Houston truck accessories to ensure you get the most from your hardworking pickup truck.